I started choosing one word for the year back in 2014. It’s not really to define what I do in the year to come or what goals I set. But the word is something I dwell on. I can look back and see how God has placed each word on my heart. Every year, the word I choose becomes a theme for my life. Whatever is happening at the time, the word I choose speaks into my situation. It connects to my current story and reveals the lesson or the Truth I need to learn next. I’ve already watched these words bring on new meaning as I fought my way into this writing journey. I didn’t choose writing at first. And I’m not really the one choosing these words. God knew what I needed before I was ready. He also knew I needed time to understand my perspective of normal on so many levels. That has always been the question I subconsciously ask…about everything. God knew writing would help me to choose courage, ask the questions out loud, and be my whole self. I knew I wasn’t focused in life. All the questions I started asking led me to the kind of focus I needed. The focus that matters is the focus that says yes to every little step God reveals. You will know when a prompting is from God. Deep down, you will know what to do next and how He is specifically calling you to obey. Saying yes to each next step leads to freedom. And finding the path to freedom leads to moving forward. Our stories don’t unfold in one giant plan. I’ve seen God unveil my journey in the small steps. This is the way I learn to trust what God is doing as I continue to take action. Small step after small step. FILL. I sensed this was the next word I needed, but I also have to admit I have a second word. I can’t get away from the whole idea of impossible. I’ve read it in my devotions for months. I hear it on TV. I see it in books. And the title of our Christmas Eve service was “Nothing will be impossible with God“…He is the God of the IMPOSSIBLE. I have some impossible dreams. They feel impossible to me because I can’t see the whole picture. Would it really be helpful for me to see everything? How would I ever learn to trust God? How could I embrace the journey of slow and steady? Maybe the small steps eventually help me to see the impossible isn’t so impossible after all. Because one thing leads to the next and God can work through anything. 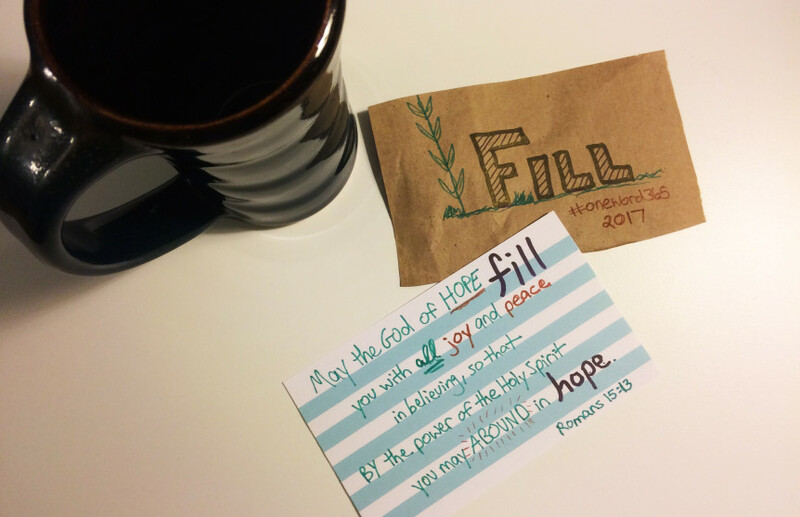 I want to watch God fill my life. to me is SO possible with God. I want to hold on to hope all year long. I want to expect mountain-moving moments. This is my prayer for 2017. What are your impossible dreams? How is God speaking to your heart? Let’s pray big and small prayers for each other this year. May God show us mighty things.